Today I am SO excited to introduce you to my good friend, Melisa, over at Let’s Get You Organized! Melisa comes to us with a ton of experience helping many of us who struggle with getting organized and are ready to adopt a decluttering mindset. By removing clutter and putting actionable processes in place, Melisa successfully helps her clients to achieve improved mental, physical, and emotional wellness. She believes that our homes should be our sanctuaries and NOT a source of stress…definitely my kind of girl. Step 1: Pick a Date and Time Saturdays are the most popular days for a garage sale. Bargain hunters are definitely early-birds, so the earlier you start your sale, the better! I recommend a start time of 7am and with the right marketing, you’ll have folks lined up in your driveway as early as 630am (even with signage that clearly states “No Early Birds”)! Once you’ve locked in your date and time, make some eye-catching signs. Neon poster board from Wal-Mart is just 90 cents per piece. I cut these into 2 for my clients and buy 4 posters, for a total of only $4 for amazing signage! Always use Sharpie and color in your lines to bold the message. Neon is the way to go- highlighter yellow, bright pink, or intense orange. Take your pick! Step 2: Create a Map Really? Yes, a map! I’m on a mission to make you more money here. A map gives you a game plan for your day and reduces morning stress at 6am during set up before the coffee kicks in. You know your driveway better than anyone, so draw it out. Clearly mark the sidewalk, grass, walkways, and planter beds. This will also help when you have friends or family help get stuff out of the garage and on to be sold. You want to merchandise your sale like a store- keep like with like and make it look shoppable! The worst garage sales are those with a bunch of cardboard boxes strewn about with random odds & ends in each. Kitchen utensils in with stuffed animals and old pool supplies? No thank you! Once your map is drawn out, start laying out locations of each category of items to be sold. Step 4: Sort and Price You have your date, your time, your map, and your toolkit – let’s get your junk in order! Every single item should be clearly marked with a price. Most customers will not find you and ask for a price- they’ve already got a price in their head that they feel something is worth and unless it’s clearly marked so they can make a decision, your sale could go right out the window! Neon pricing stickers from Wal-Mart or Staples are about $2 for 100. Clearly worth it! Take your stickers and get yourself into a sticking frenzy. Then once items are sorted, take your Sharpie and clearly mark your boxes with a general description of what’s in them. Step 5: It’s the Big Day! Get up early, get your signs and tape in the car, and set out on a neighborhood canvassing activity to get those signs up and get those customers at your sale. Ideally, you’ll have a friend post signs while you start bringing out the goods. Once everything is out of the garage, merchandise your little heart out. Think of your driveway as a boutique- the better the merchandising, the more money you’ll rake in! Display jewelry on a black towel or shirt- it will make the jewels pop and make your customers buy. Use rugs or tarps to specify certain areas- think toys with toys, garden supplies with garden supplies, kitchen goods with kitchen goods, you get the drift. When it comes to clothing, this is the only time I’ll tell you it’s okay not to individually price. Customers love blanket pricing on clothes- each item for $2? Sign me up! By labeling the price clearly on the front of your clothing tarp/blanket/rug, customers will know what the items are and how much they cost. Bring on the folding tables! Avoid placing any item (especially breakable dishware) on the ground. Value your sales and get them up on a table. Don’t have any? Ask neighbors or friends – someone you know could lend a few to you. Place a sheet over the table to further your boutique look and set you up for successful sales. And finally, invite some friends (bonus points for wearing matching outfits to make it easier for customers to find people to pay), make some coffee, play music, and have fun! When you go into your garage sale with a plan and a system, you will have success – this particular sale gave my client over $400! Step 6: End the Sale At the end of your sale, take your signs down, bag or box up your unsold items to be loaded into the car and taken to the charity of choice, count your money, and take it to the bank! Would you like LGYO to help you come up with a map, a toolkit, a day/time, a sorting system, a pricing guide, and a game plan for your big day? 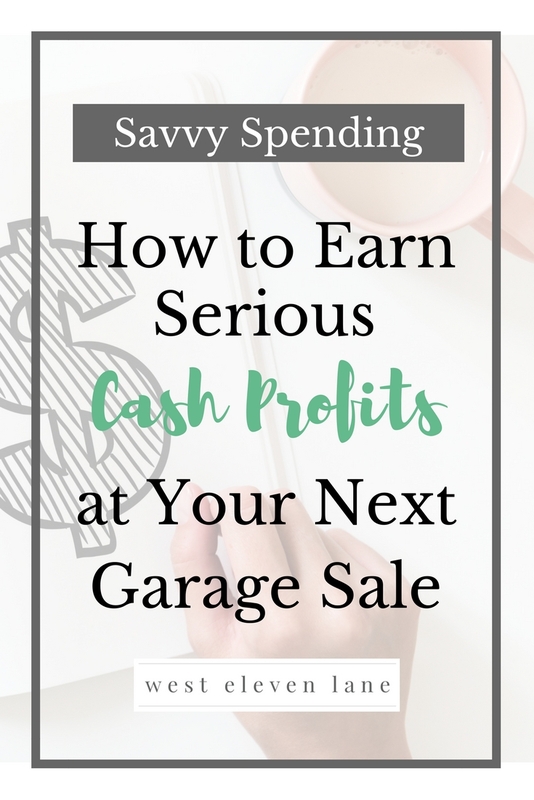 Not ready for a garage sale but need some organizing inspiration? Follow me on Instagram @letsgetyouorganized or fill out a quick and easy Contact Form and Let’s Get You Organized!